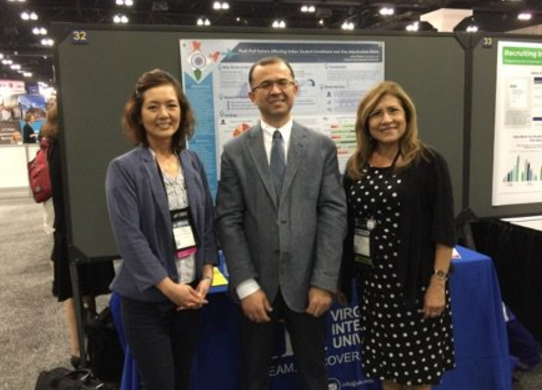 This year, Dr. Suleyman Bahceci, Executive Vice President; Allison Forbes, Associate Director of Student Affairs; Erico Palmer, DSO; and Betty Jensen, Community Relations Specialist/DSO; attended the NAFSA 2017 Annual Conference at the end of May in Los Angeles, CA. Eriko Palmer attended the NAFSA conference for VIU this year and presented a poster on Push-Pull Factors Affecting Indian Student Enrollment and Visa Adjudication Rates. Dr. Bahceci presented at the session, “Working with Agents: Expanding International Student Recruitment Strategies.” Dr. Bahceci was happy to present with Ian Cann from ICEF to a great audience (174 attendees). It was truly exciting to meet some incredible colleagues from all over the globe.